The Orthostatic test is a generally used tool for monitoring the balance between training and recovery. 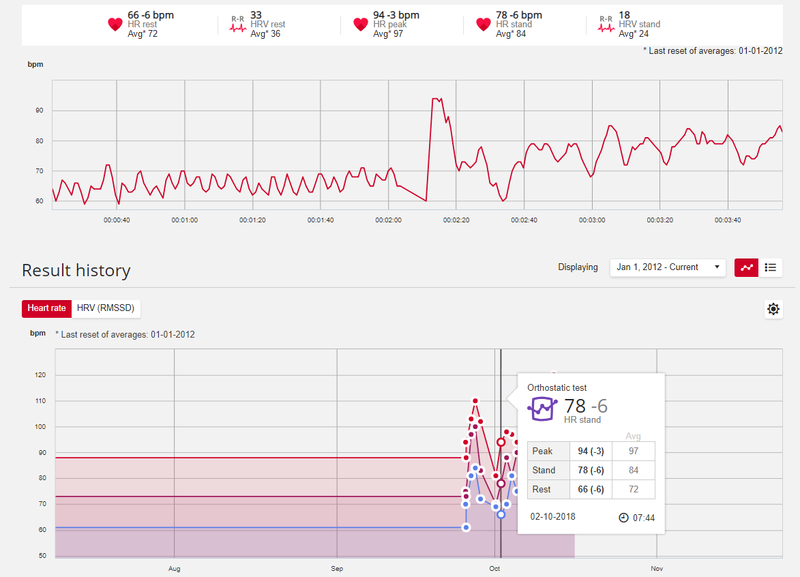 It allows you to track how your body responds to training. In addition to training induced changes, there are many other factors that can affect your Orthostatic test results, such as mental stress, sleep, latent illness and environmental changes (temperature, altitude) to mention a few. The test is based on measuring heart rate and heart rate variability. Changes in heart rate and heart rate variability reflect changes in the autonomic regulation of the heart. Wear the heart rate sensor with the strap. Moisten the electrode area of the strap and wear the strap snugly around your chest. You should be relaxed and calm. There should be no disturbing noises (for example, television, radio or telephone) or other people talking to you. It is recommended to perform the test regularly and at the same time of day in the morning after waking up to get comparable test results. On your watch, choose Orthostatic test > Start the test with HR sensor. The watch starts searching for your heart rate. When your heart rate is found Lie down & relax is shown on the display. You can be seated in a relaxed position or lying in bed. The position should always be the same when you do the test. Do not move during this first part of the test, which lasts for two minutes. After two minutes, the watch will beep and Stand up is displayed. Stand up and remain standing for another two minutes until the watch will beeps again, and the test is finished. You can interrupt the test in any phase by pressing BACK. Test canceled is then displayed. If your watch cannot receive your heart rate signal, Test failed is displayed. In which case, you should check that the heart rate sensor electrodes are wet, and that the textile strap fits snugly. HR peak: This is the one highest heartbeat that occurs after you stand up. HR stand: Average heart rate when standing still. View your latest test result on your watch in Orthostatic test > Latest results. Only your most recent result is shown, and only your first successful test for the day is taken into account as a part of Recovery Pro. The difference of your HR rest, HR peak and HR stand values to your averages are shown in parentheses next to your latest result. When you’ve performed at least two Orthostatic tests during 28-day period, you’ll get feedback on your cardio system’s recovery on your watch after the test. The feedback is based on your heart rate variability values compared to population norms. After performing at least four tests in a 28-day period your latest Orthostatic test result is compared to your individual normal heart rate variability (RMMS) range. Your normal range is calculated from the standard deviation of the test results from the past 4 weeks. As heart rate variability values are very individual, the accuracy of the test result becomes more accurate the more measurements are done. For a visual analysis of your Orthostatic test results, go to the Flow web service and choose the test from your Diary to view details from it. You can also follow your test results in the long-term and spot any deviations from your baseline. The Orthostatic test is also an integral part of the Recovery Pro feature in Vantage V that tells if your cardiovascular system is recovered or not. It compares your Orthostatic test results to your baseline gathered over time, and also takes into account your subjective recovery, as well as your long-term training history.